Sachin Ramesh Tendulkar, the name is enough to get the attention of cricket loving Indians. He has been tagged as “The God” every time he walks into the grounds. The all time Indian cricketing legend celebrates his 40th birthday today, and my social feeds were the first to inform me how auspicious was today. From sharing rare and interesting pictures of the master blaster to wishing him on networks, my feed was all about the God. Brands who wait for such occasions to connect with fans joined the celebrations too. Aviva Life Insurance that has been focusing on the bond between a father and child to create active communities of responsible parents made sure that they wished their brand ambassador in a grand way. The brand created a Facebook app – “Wish Sachin Happy 40th” for it’s more than 148K fans. 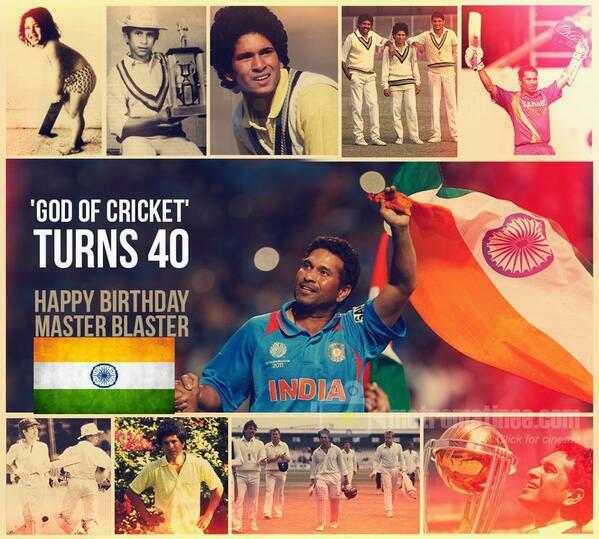 The app invites fans to wish him on his 40th birthday and Aviva India will make sure that the messages reach Sachin. Additionally, amazing birthday messages will also be lucky to win exclusive merchandise signed by Sachin. To build the momentum, the brand is updating some exciting visuals to engage with fans. Mumbai Indians, the IPL team that Sachin represents, was also not left behind from updating an amazing creative visual on Facebook. The visual that wished the master on his 40th birthday, has already been shared more than 10K times, more than 3K people have commented and more than 39K fans have liked it. Now this kind of engagement only Sachin can drive! The day’s cake was also a gift from Mumbai Indians for the birthday boy. Images and videos from the birthday celebrations have been shared by the Mumbai Indians and Sachin’s Facebook page. The Twitter community is also witnessing celebrations from fans. Hashtags like #SachinBabaChaalisMore and Sachin Ramesh Tendulkar have been trending in the list of top 10 trends from India. The hashtags are trending while I write the post and it’s my guess that they might continue to trend tomorrow too. Mumbai Indians, which has more than 174K followers on Twitter, has started a contest #WishSachin. Fans have been asked to tweet amazing birthday messages before 5:30 PM and the best ones could win merchandise signed by Sachin. On the other hand, #SachinBabaChaalisMore is a quiz that is being run by the ecommerce brand, Yebhi. The brand has gone for a makeover for its Twitter account on the occasion of the birthday and has been asking 40 questions on Twitter since morning. Each right answer stood a chance of winning a gift voucher of Rs. 1000. And you might have guessed that all the questions are around the master blaster. It was a great moment for fans to show their love for the birthday boy. These were some of the brands who didn’t miss out on wishing the master and connecting with fans on social. If I have missed out some interesting ones then do share them in the comments below. And, I would like to take this opportunity to wish the cricketing legend though I am a very small fan. I have respected you more for your humbleness on field and off field. It is an honour to be born at a time when you play the classy straight drives.